Keeping up with your kitchen when you love to entertain in your Atlanta apartment seems complicated. You want to keep your oven clean to ensure that your food has the right taste. A clean oven also prevents unpleasant odors from lingering food items burning during the cooking process. By focusing on the right strategies, you can clean your oven without using harsh or unpleasant chemicals. Before you start working on the oven, remove the racks and place them in your sink. You want to soak the racks in water with dish soap before you take any further action to clean the racks. When you are ready to handle the racks, use a scrubbing pad and gently clean the entire surface with dish soap and warm water. When you live in apartments in Atlanta, you do not need to use harsh chemicals to keep up with cleanliness. An easy way to clean your oven without using a harsh chemical is with a baking soda paste. Mix three parts baking soda with one part water, so if you are using one cup, you will need 1/4 of a cup of water and 3/4 of a cup of baking soda. You may need more for stuck-on and stubborn stains or if you feel that the amount is not enough. Fill the openings of the oven with foil and then use a brush or a cloth to cover the interior with the paste. Do not put the baking soda paste on the door or any bare metal surfaces. Let the paste sit overnight and then scrape it off. You can use a wet cloth to finish up the cleaning and remove any streaks. The final step of cleaning your oven without harsh chemicals is with a vinegar solution. Mix one part white vinegar with one part water. Wipe the inside of the door. Repeat the process as necessary to remove any stuck-on oil, dirt or other food particles. Avoid the gasket when wiping with vinegar. Allow the oven to dry completely before you put the racks back into the oven and close the door. Cleaning your oven is a process, but it does not require the use of harsh or dangerous chemicals. 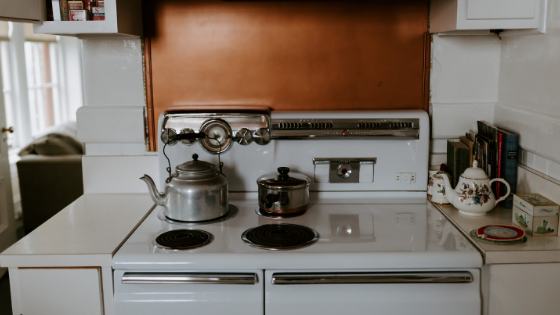 By using baking soda and white vinegar, you can remove stuck-on foods and unpleasant odors from the oven in your Atlanta apartment. To learn more about cleaning your apartment or to view apartments in Atlanta, call or contact us today.